Myself? I was never part of that beachy lifestyle. I loved the beach, still do in fact, but I am too fair to be able to enjoy it without 70 spf sunblock, a hat, and an umbrella. Some of us were just not made for sun worship... I think that I've joked on here before that I'm part vampire, since my skin seems to catch aflame with the tiniest bit of sun exposure. I'm still rockin' a painful (and bright red) sunburn from our 3 hours at the craft fair last weekend. And I was wearing sunblock! LOL!!! Still, I love the laid-back beachy vibe. Even though we live about 10 miles inland, in the heart of Disney, the beach and surf cultures still seem to permeate much of the fashion and music in this area. I don't get dressed up to go out, I wear flip flops year-round, and Mims listens to Jack Johnson for bedtime music. And I love, love, love beachy bohemian jewelry. 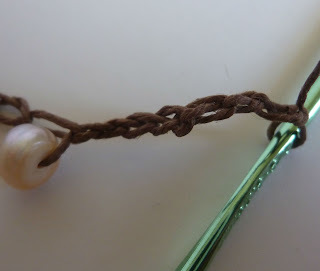 Once all of your beads are on, make a slip knot in the front end of your cord (the end you were just using as you put the beads on). 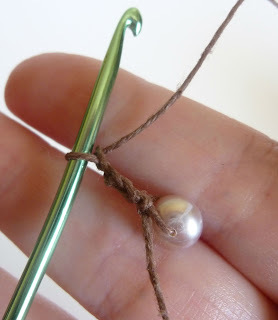 Slide the first bead snugly against the knot. Using your crochet hook, yarn over (from the other side of the bead) and pull a loop though the slip knot to make the first chain (this bead will become the first half of the fastener for the necklace). Chain 4 more times. 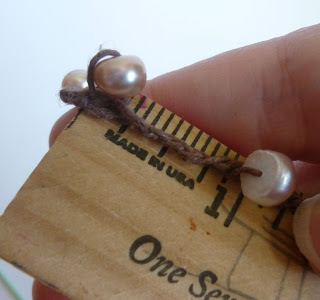 Slide the next bead up snugly to the chain. Yarn over from the other side of the bead to pull the loop through and attach the bead. 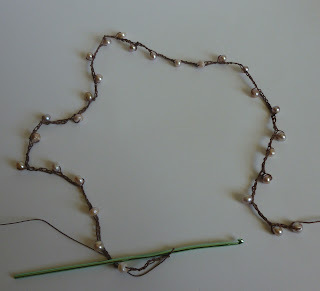 I used a pattern of 5 chains between beads, which was almost an inch, so that my necklace would be about 23 inches long. 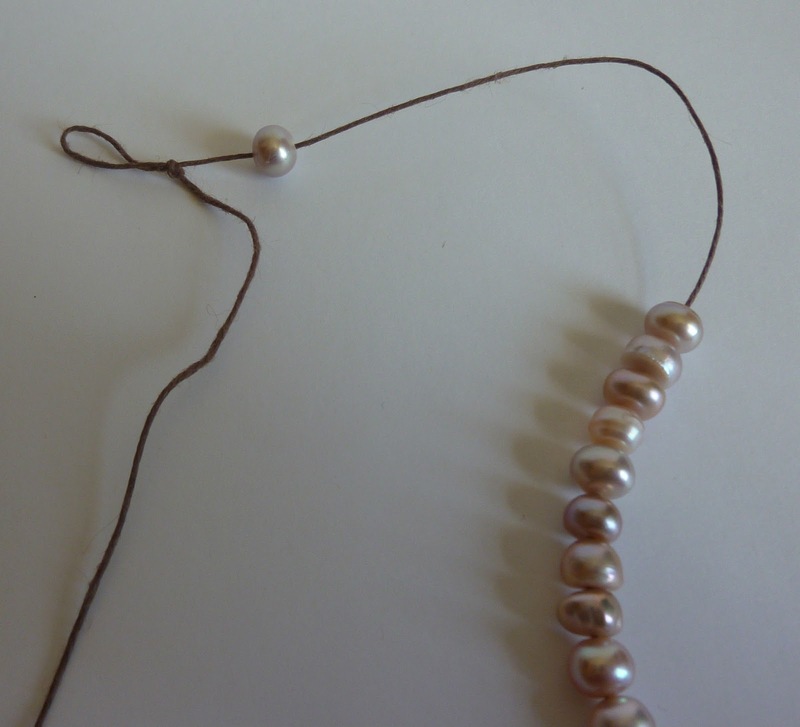 If you would like a longer or shorter necklace, you can adjust the number of chain stitches between your beads. This is what mine looked like once I got all of my pearls added to the chain. 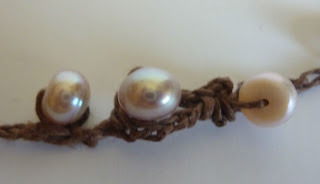 To make the closure, I made 8 chain stitches from the last bead. 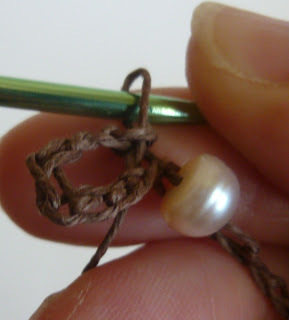 I slip stitched the last chain to the 7th chain from the hook to form a ring. I made 2 single crochet stitches around the remaining stitch in front of the bead, and then I fastened off the cord. 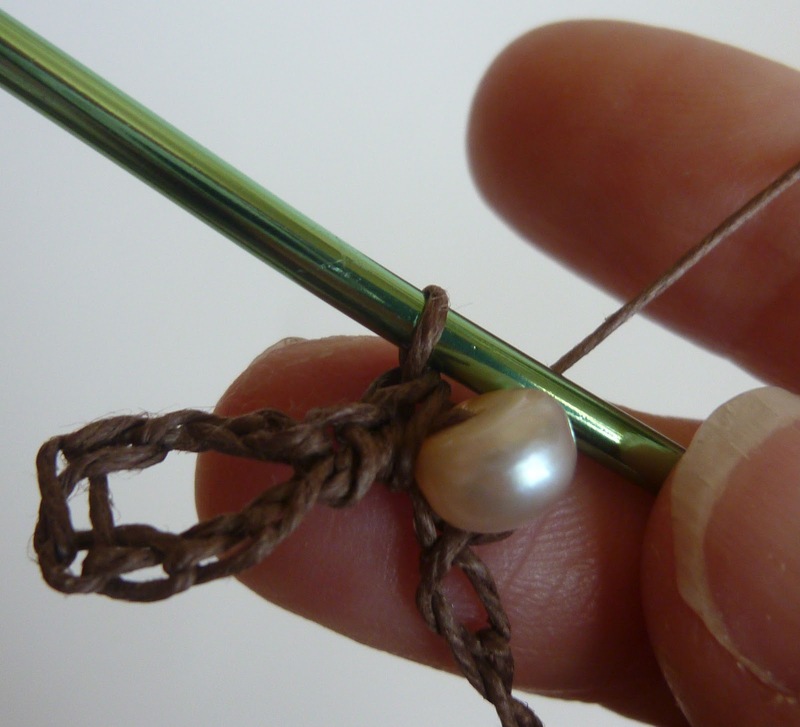 I used my tapestry needle to weave in the ends. They were pretty easy to hide along the chain. 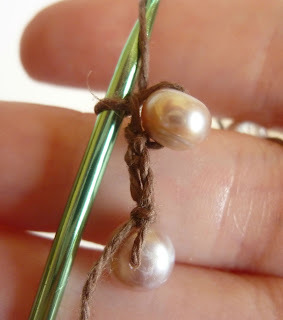 Snip off any extra cord once the ends are sufficiently woven in. 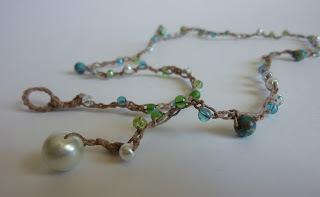 I made this one out of glass beads and glass pearls, with some dyed jasper (although turquoise would have been nice too). 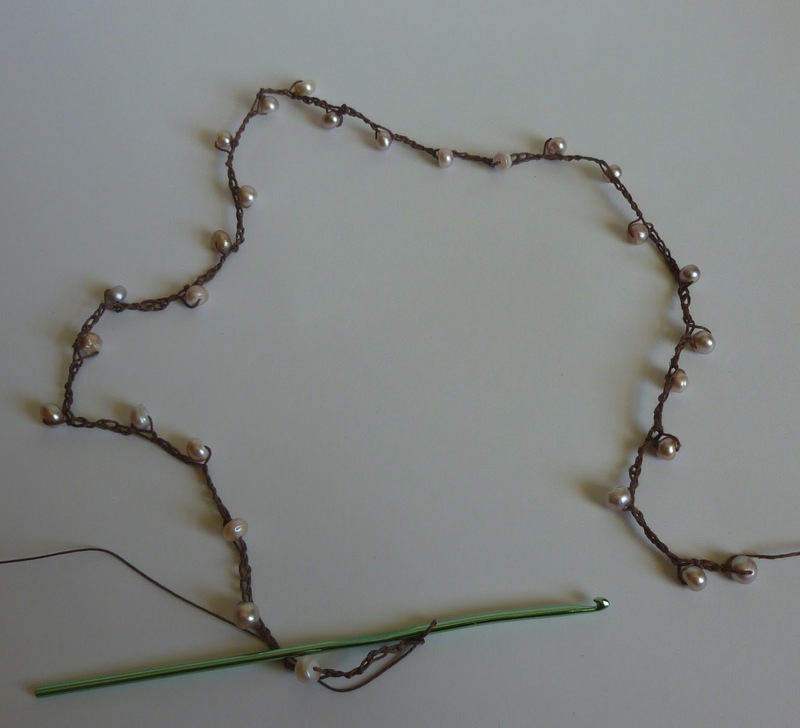 I only used 2-3 chains between beads. The end pearl is 10 mm. I love it. It's so beachy and fun. I made one for Mims, who wore it swimming and declared it to be perfect mermaid jewelry. I made one for my sister, who declared that she was absolutely not going to wear it swimming, despite my assurances that it was completely water safe/waterproof. But I found out later that it was just because she wanted it to stay beautiful and perfect to bring her good luck at an appointment she was going to the next day. If you make some surfer girl jewelry, I'd love to see it! 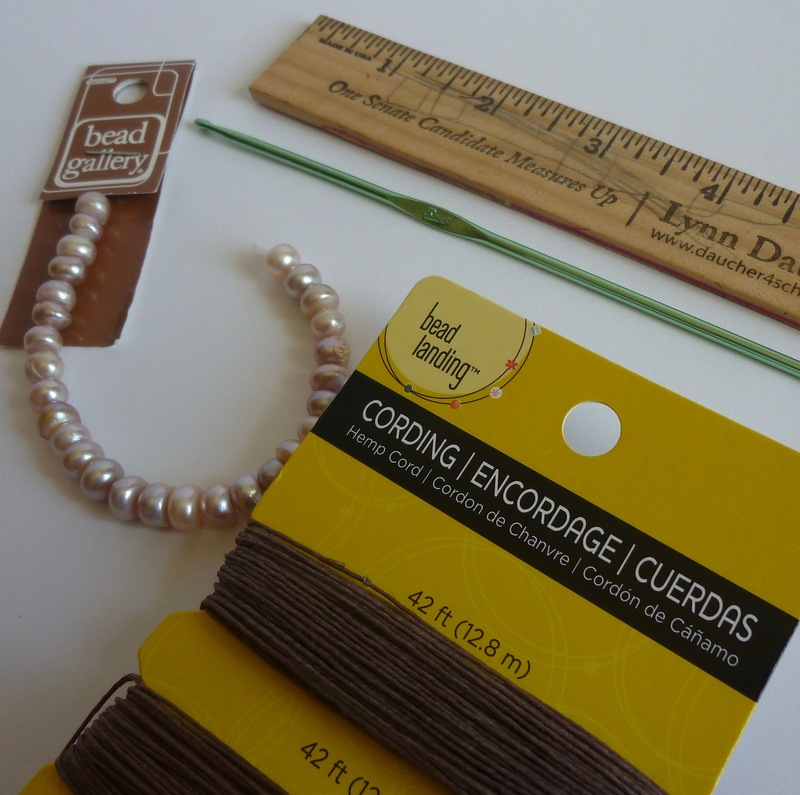 Send a quick picture to CrochetDynamite@gmail.com and I'll add it to the Dynamo Gallery! Mahalo! Oh, and Karen, Nancy, Charlotte, Leah and Laura were the winners of my giveaway. I had my 91-year-old grandma pull the names out of a bag. Thank you all for playing! Yay! Thank you and thanks to your grandma! I'm so excited!! How do I get contact info to you? Hi Nancy! I tried to email you, but there wasn't an address in your profile. So send me a message to CrochetDynamite@gmail.com and I'll get your package on its way today! And the same goes for Laura! Laura send me an email address!!! A perfect gift and a beautiful piece of jewelry for the summer. Thanks so much, Line! I think so too! Beautiful! I've been meaning to make some necklaces just like that but never got around to actually doing it. You've inspired me (yet again!). I'll have to whip up a few for my CA vacation next week. Thanks for posting!!!!! Hi Sue! Yes!!! You totally need them for your CA vacation! Are you going north, or coming down here to SoCal? Sassy. You are supposed to be in awe of my celebrity, not mock me, woman! Yay, I won! Thank you so much, it is absolutely awesome and the necklace is just adorable I love them both. You Rock Jaime! I'm so glad you like them! You rock too, Leah! Love the simplicity of it. Thx for sharing.